The terrorists insist on "527 to 42" exchange formula. The terrorist organisation Donetsk People's Republic refused to discuss the proposal of MP Nadiya Savchenko on the exchange of 42 Ukrainians held captive on the occupied territory of the region for 256 separatists. "We are negotiating with a clear position on the exchange of all confirmed names of persons at all. Thus, we seek the return of 527 people held by Kyiv in exchange for 42 citizens of Ukraine in our custody," the so-called DPR ombudsman, Darya Morozova, told Interfax on 10 January. She rejected Savchenko's plan as "unacceptable". "Savchenko just reiterated Kyiv's previous offers to give us only half of the total number of persons detained by Kyiv, meaning 256 people. That is, it is not even about an exchange of persons, but simply a decision of the Ukrainian authorities to give us only half of the detained persons, which is unacceptable," Morozova said. "Among the persons held by Kyiv, in addition to DPR and LPR citizens, there are Russian citizens. 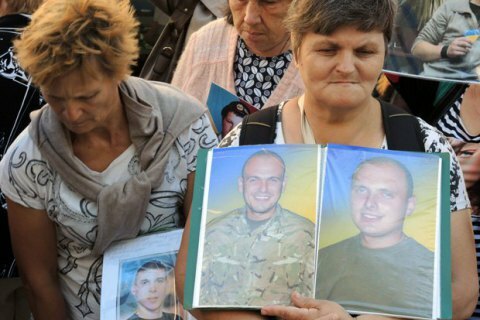 Therefore we insist on the return of all persons, who are illegally held by the Ukrainian authorities, whose whereabouts and personal details have been confirmed," she added. Earlier in the day, Savchenko published a list of prisoners held by Donetsk and Luhansk militants and her own plan of a three-stage prisoner exchange.